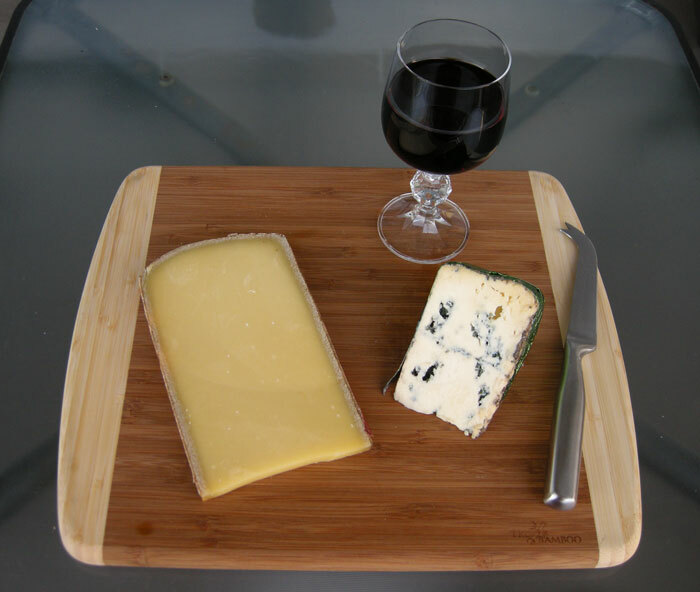 Bliss: Comté, Bleu l'Élizabeth and a glass of Jim Jim. Sometimes, a board featuring only two cheeses is more than enough to satiate the senses. Last night was such a time at our house. Significant Other and I started with a divine 24-month Comté and stopped talking for the longest spell while moaning with delight about Le Bleu l’Élizabeth. The fully mature Comté was recommended to us by Geoff at Chris’ Cheesemongers in Toronto’s St. Lawrence Market. He knows how much we enjoy an Alpine cheese such as Beaufort d’Alpage. Comté has been made in the Jura Mountains in southeast France since the 12th century. It has the highest production figures of all the French AOC cheeses (51,000 tons in 2005, or about 1,275,000 wheels every year), a testament to its distinctive deliciousness. It’s a raw cow-milk cheese with a natural brushed rind that is aged on average for eight months. The maturing period ranges from four months (the legal minimum ) to 12, 18 or even 24 months. Comté: Spectacular caves to age a spectacular cheese. Delimited area of production: Doubs, Jura, Ain, elevation 1,500-4,500 ft. Milk must be produced by local cows of the Montbéliarde (95%) and Simmental (5%) breeds. There are about 112,000 Comté cows. Minimum of 2.5 acres of natural pasture for each animal. Cattle feed must be natural and free of fermented products and genetically modified organisms (GMO). Each fruitière must collect milk from dairy farms within a 20-kilometre diameter at maximum. Milk must be made into cheese within 24 hours of the earliest milking. Of course no modified milk ingredients (MMI) are allowed. Only natural ferments must be used to transform the milk into curds. Wheels must be aged on spruce boards. It takes as many as 530 litres of milk, which is about the daily production of 30 cows, all to make one wheel of Comté weighing 40 kilograms. Those numbers are staggering in a world where progress is measured in ever increasing productivity and, sadly, often decreasing quality. The texture is firm, the rind is grey-brown and pebbled, and the flavours burst forth in so many ways: Complex, nutty and caramelized with a lingering but not sharp flavor. The taste is variable depending on the age and the season of the milk. It’s typically described as salty, mild, and fruity. Some Comté has strong hazelnut flavours, other exhibits subtle hints of nutmeg. Comté goes well with either dry white or light red wines, but we’re fans of bold fruit-forward wines, thus, we paired both cheeses with our last bottle of Jim Jim, a 2008 Australian shiraz. I only expected SO to pick up the Comté at Chris’s, but when she spotted Bleu l’Élizabeth, she couldn’t resist one of our favourite blues. It was the perfect match for the Comté and made for a memorable evening. Sides of duck paté with pistachio and rare roast-beef slices and a caraway rye only enhanced the experience. Indeed, Bleu l’Élizabeth is a beauty, and unusually creamy and rich, with prominent Penicillium roqueforti veins that are blue, or green, according to the eye of the beholder. In 2009, it was declared the gold standard in Selection Caseus, the chief cheese competition in Quebec. A former rectory houses Fromagerie du Presbytère in Sainte-Élizabeth de Warwick. 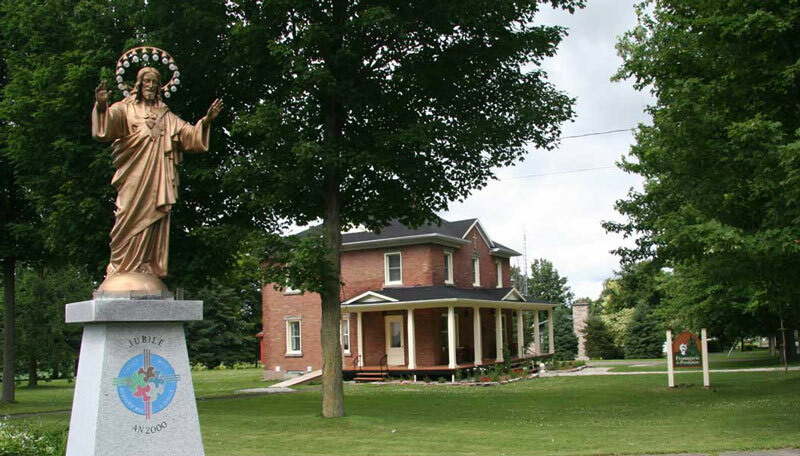 The cheese is made in Sainte-Elizabeth de Warwick in central Quebec at Fromagerie du Presbytère housed in the former rectory of the village Roman Catholic church. Across the street is La Ferme Louis d’Or where Holstein and Jersey cows provide the organic raw milk for cheesemaking, after feasting on clover, bluegrass and other organic grains in season, dry hay in the winter. Brothers Louis and Dominique are the fourth generation of the Morin family to run the dairy farm. Louis started cheesemaking almost 20 years ago, under the Fromagerie du Presbytère label four years ago this month. Louis d’Or, the Alpine-style cheese that won Caseus 2010, is also made at Fromagerie du Presbytère as is buttery Le Champayeur, a soft-ripened cheese. The question is, after two gold medals in the Caseus competition, how will Jean Morin next knock our socks off? Georgs Kolesnikovs, Cheese-Head-In-Chief at CheeseLover.ca, plans to visit Fromagerie du Presbytère again in the next month or three to seek the answer.